The Baha Mar resort on Cable Beach has been honored with gold and silver at the prestigious 2017 Travel Weekly Magellan Awards for excellence in destination marketing. The Baha Mar Grand Opening Campaign was recognized with an esteemed Gold Award in Destination Marketing – Advertising/Marketing, Travel Weekly’s highest honor. Executed in partnership with GoConvergence, the Baha Mar Grand Opening Campaign is comprised of three distinct productions: the “Be the First to Know” preview video, providing a glimpse into the world of Baha Mar; the launch of Baha Mar’s sophisticated, interactive website and the “Now Open” high-energy web video, showcasing the excitement and celebration of life at the newly-opened resort. 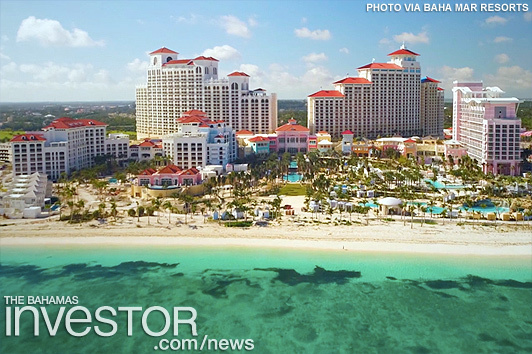 Baha Mar was also presented with the Silver Award in Destination Marketing – Promotional Video for “Be the First to Know.” The preview video was designed and shot to pique the interest and excitement of potential consumers and industry audiences, ahead of the phase 1 opening of Baha Mar. Also created in partnership with GoConvergence, “Be the First to Know” evokes the stimulating energy and world of possibilities at the sparkling new resort destination, as well as the unparalleled beauty of the Bahamas. To complete the winning productions, GoConvergence executed a series of dedicated on-island photo and video shoots throughout 2017. The Travel Weekly Magellan Awards honor outstanding and inspiring content throughout the travel and hospitality industries, while recognizing the exceptional travel professionals behind it all. Baha Mar was recognized with the highest honors alongside the top destinations, hotels, resorts and travel companies in the world. The 2017 judging panel was comprised of top travel industry professionals across hospitality, tourism and travel media, including Peter Greenberg, Travel Editor for CBS Early Show; Colleen Kelly, National TV Series Host; Patricia Schultz, Author of 1,000 Places to See Before You Die; and many others. Baha Mar’s planned phased opening continues with the launch of SLS Baha Mar in November 2017 and enhanced and expanded Rosewood Baha Mar in spring 2018. Baha Mar’s Marketing & Advertising Campaign will also launch later this year. Bahamas Minister of Tourism and Aviation Dionisio D’Aguilar says he is looking to renegotiate contracts with cruise companies to increase the economic benefits for The Bahamas. Watch an interview with the Minister here. Bahamas Out Island Promotion Board has launched an awareness campaign about marketing initiatives to promote its members’ services. Watch a ZNS Network news segment about the project here.